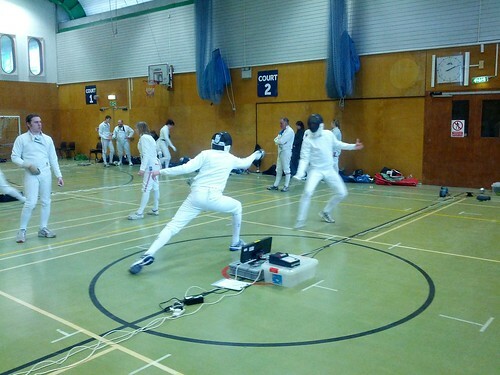 Sway Fencing entered a large group to both the single events and the team events at the Hampshire Senior Epee today, and we had a great time facing off against some great fencers. This is the first competition I've been to outside of the novices event in September last year, so was a big eye opener to the level some of these guys and gals were fencing at. Vicky Pritchard took first seed, but ended with third place in the women's senior epee. Personally, I didn't do amazingly well getting knocked out in my first direct elimination round, but the experience was well worth it. Here's one of the pictures from the day taken by David Wilkins, you can see the rest here if you're interested.